Here on the east coast, we are getting hit hard by Hurricane Sandy - I'm on Long Island but not too close to the water so I'm hopeful we'll get through with just a few broken branches in the yard. Still, there's a really good chance that we'll lose power (I'm surprised we haven't already, actually. The winds are already ridiculously strong and the hurricane hasn't even touched down here yet.) If you don't see any posts for a few days, it likely means we're without electricity. I was going to try to take some photos and get a few reviews up today, but it's so dark and gray that there's just no decent lighting. I'll get back on track as soon as I can, though - and I've got a bunch of great products to share with ou guys, so I can't wait! If you're in Hurricane Sandy's path, stay safe and I hope that we all pull through without too much damage. Thank you to everyone who entered The Balm Shady Lady Palette Vol. 1 Giveaway. As I said yesterday, I loved reading everyone's responses. I am happy to announce that the winner is Lisa Brown. I probably sound like a broken record at this point, but don't worry if you didn't win - I'll do another giveaway in about a month. It's for another of my favorite eye palettes, so definitely keep an eye out. As always, thank you to everyone who reads the blog, leaves comments and sends emails. I love sharing my makeup obsession with the world at large, but you all make it even more fun. Just a little reminder that you have until tonight at midnight EST to enter the Balm Shady Lady Palette Vol. 1 giveaway. This is one of my favorite palettes - it's got plenty of shades for a sultry smoky eye, as well as a few for softer looks. And the Balm's shadows are just fabulous so they're super easy to work with. You can find all of the details on entering here. I do actually have a quite few new products that I've been loving lately, so keep an eye out for some interesting reviews in the next couple of weeks. 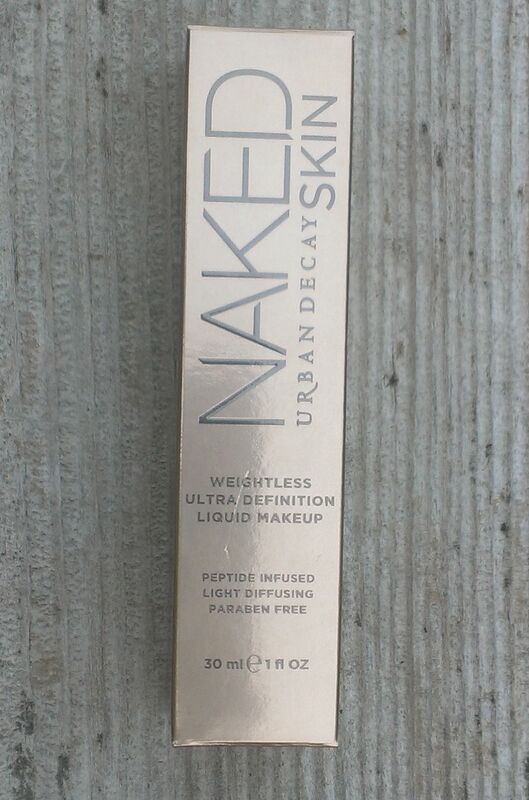 I've wanted to try the Urban Decay Naked Skin Weightless Ultra Definition Liquid Makeup ($38) since it came out. I forced myself to hold back, though, because I need another bottle of foundation like I need a hole in the head and I told myself to at least wait until I finished one of the many in my collection before buying another. But then, Urban Decay had their 20% off Friends & Family sale, and I decided that I'd been patient enough. I mean, I waited like three whole months - that's something, isn't it? By now, it's pretty obvious that I'm a total sucker for any and all QVC beauty-related TSV's. But I was especially excited to get my November InsideQ magazine and see it chock full of some pretty great deals. I've actually only ordered one early, but I suspect that I'll be persuaded to be one or two more when they actually make to the air. 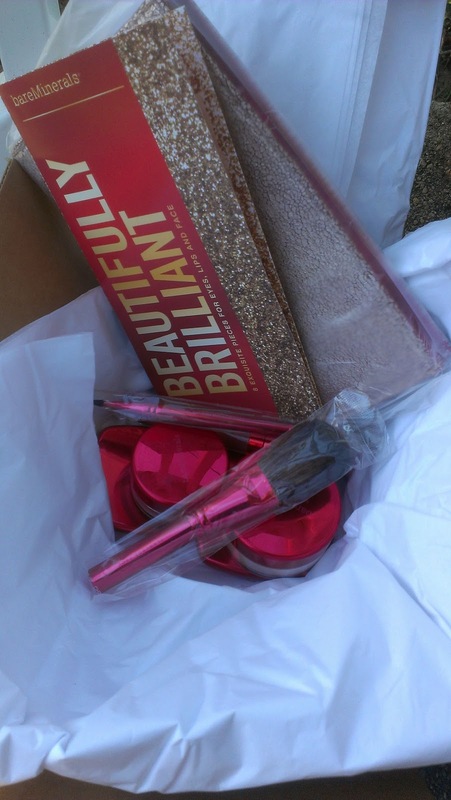 The one TSV that I decided to order early is the bareMinerals Beautifully Brilliant Holiday Collection, which will air on November 16th, and while it only arrived today and haven't had much chance to play with it, I am seriously glad that I did. If you've been wanting to pick up something from Tarte, now's the time to do it. 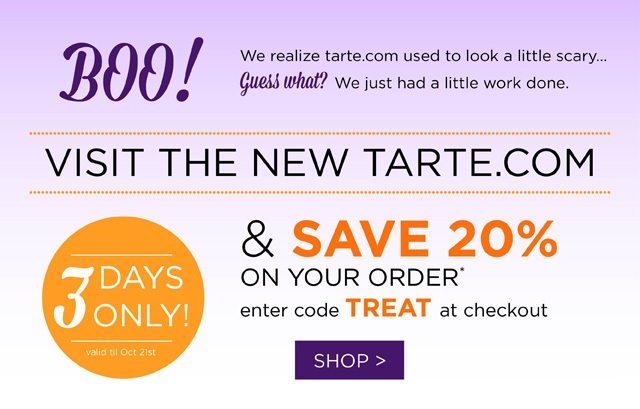 For the next three days (until October 21st), you can score 20% off the Tarte website with the code TREAT. You also get free shipping if you spend at least $40. Holiday collection sets like the Amazonian Clay Blush foursome and LipSurgence 5-Piece set don't appear to be eligible, though, so keep that in mind. There are still plenty of other goodies to try, though - I love the Maracuja Creaseless Concealer, Maracuja Miracle Foundation, the individual Amazonian Clay Blushes, the Airblush Maracuja Blush and the LipSurgences. I like most things from Tarte, actually. If you're still on the hunt for the perfect mascara, you may want to visit Haute Look today. 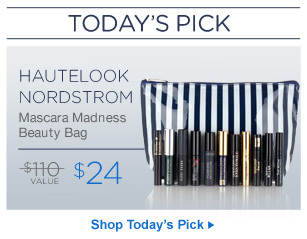 For $24, you can purchase Nordstrom's Mascara Madness Beauty Bag, which contains 11 deluxe samples of mascaras from a range of brands including Giorgio Armani, YSL, Lancome, Estee Lauder, bare Minerals, Stila and Smashbox. It's a great way to try a bunch of mascaras and (hopefully) find the perfect one for you. And you get a little makeup bag too. If I didn't already have a drawer full of mascaras I've yet to try, I would totally be jumping all over this deal. You can sign up at Haute Look here. 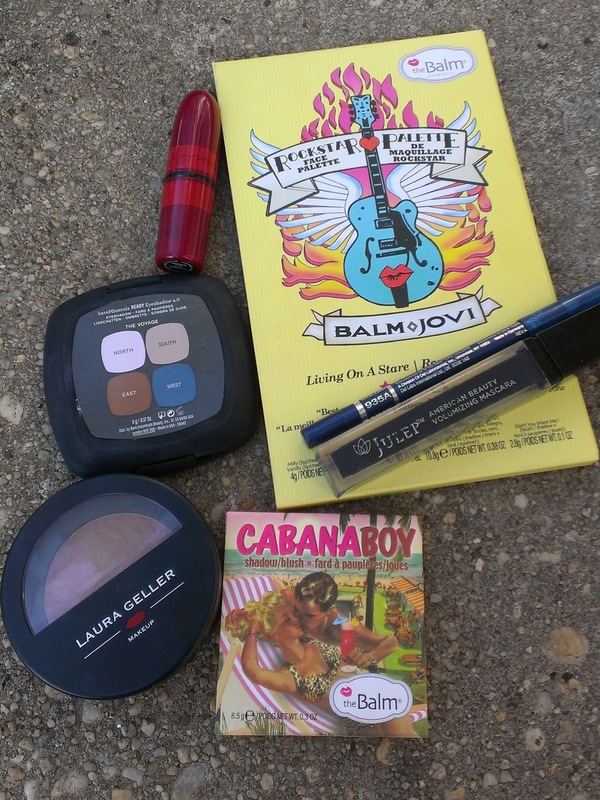 Also, just a reminder that I'm having a giveaway for The Balm's Shady Lady Palette Vol. 1. You can find all of the info here. I have treated myself to quite a few makeup goodies recently, so I thought that it would be good karma to share a little and do another giveaway. 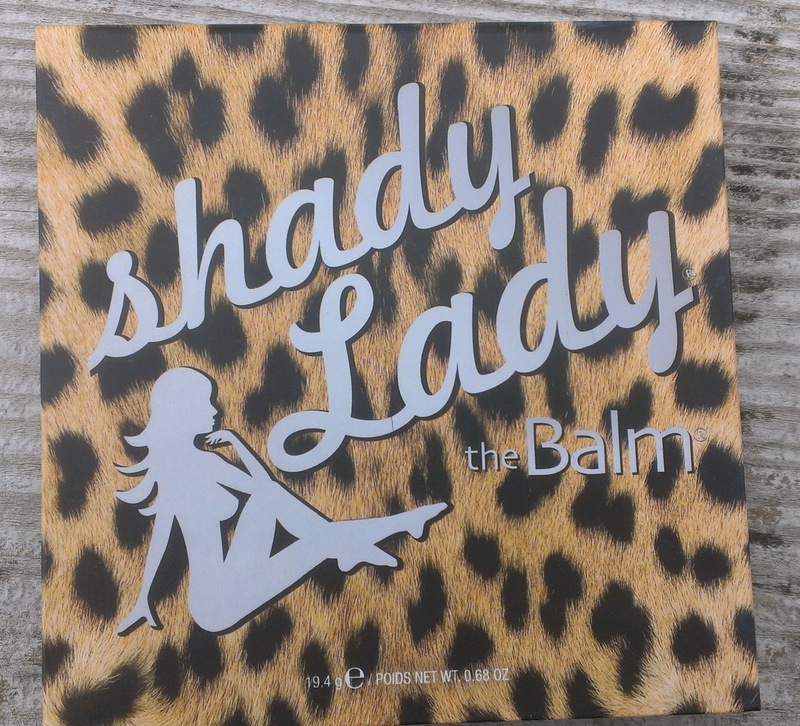 The first product that I ever purchased from the Balm was the Shady Lady Palette Vol. 1. As such, it has a special place in my heart. I love the colors, too, which is probably one it's right up there as one of my favorite palettes of all-time. Because you must know by now that I love the Balm's shadows - the formula is amazing, for sure, but I'll spare you from another rambling post about that. 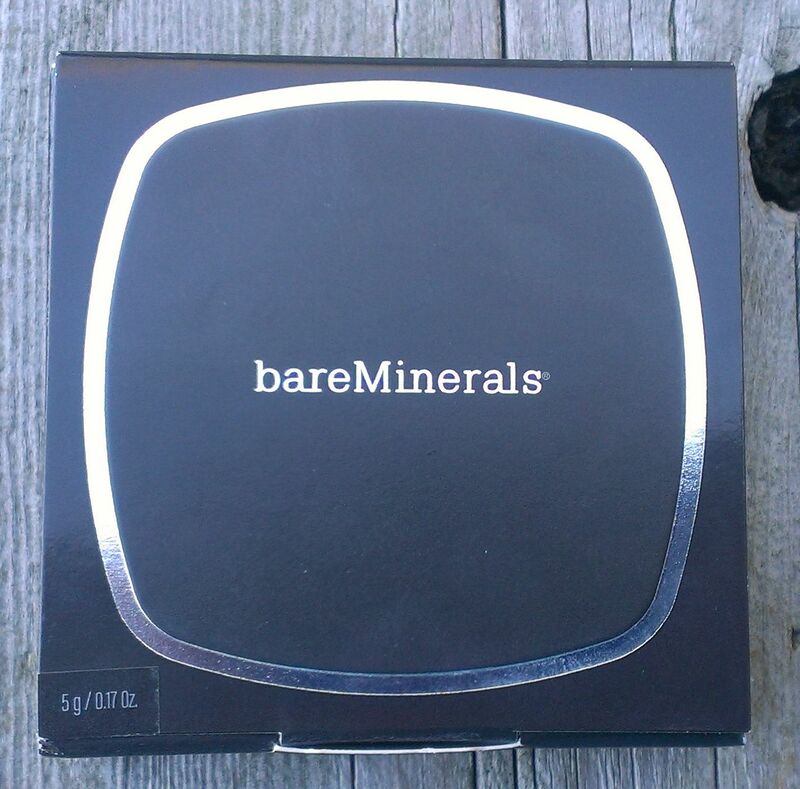 After I bought the bareMinerals Ready Eyeshadow 4.0 in The Voyage at the end of the summer, I was itching to get another of these fabulous quads. I have one other in my collection, The Elements, and I love that one too, so it seemed like a no brainer really. The trouble was choosing which one to get. There are a ton of lovely colors - I've had my eye on The Truth forever - so I don't think you could go wrong. Still, when I was looking on Sephora at the options, there was one that really caught my eye. It just seemed like the perfect collection of colors for fall. Starting today at 11am EST, LORAC is on HauteLook. If you aren't a member of HauteLook yet, you can sign up here. You have to be a member to shop, but membership is totally free. If you pick up anything from the sale, share below. I've got to be honest - I hate pretty much 99% of the perfumes that I try. I don't think of myself as particularly sensitive to fragrance, but I find most perfumes to be too strong, heavy, too cloying. I prefer light, clean scents or at least scents that are a bit softer. I mean, my favorite perfume is LA VANILA's Vanilla Coconut , which isn't exactly a light scent. But it is nice and soft and warm - and I find it to be a good year round fragrance. I swear, I must wear it 9 times out of 10 when I actually remember to put perfume on. Last year, after wanting to try the line for a long time, I purchased a couple of perfumes from Toyko Milk. I just had to get their Poe's Tobacco fragrance (because I'm a huge Edgar Allan Poe fan and there's an adorable raven on the label) but I think there was a deal going on where you got a certain percentage off if you bought two or more. So a whim, I picked up Paper & Cotton too. You know you're signed up for too many QVC beauty TSVs when one arrives on your doorstep and you had no idea it was coming. That's what happened this week with the BE Bare Luxury TSV. My hardworking UPS man brought the fourth and final installment in the series yesterday, taking me totally by surprise. In a good way, of course. I was having kind of a blah day and there's nothing like new makeup to perk you up, right? 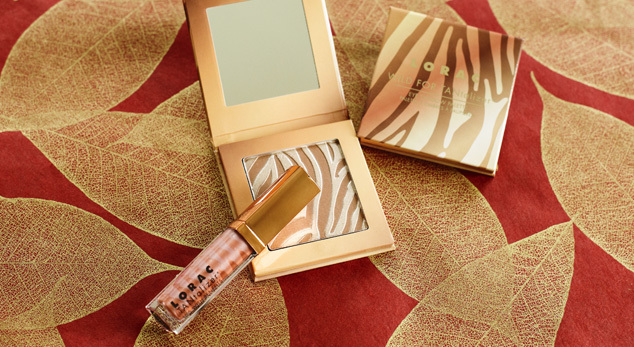 If you've been wanting something from Urban Decay, now's the perfect time to do some shopping. 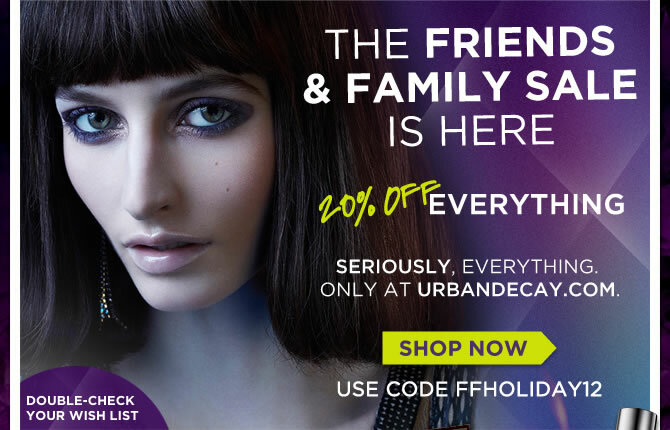 Urban Decay is offering 20% everything on their website right now as part of their Friends & Family sale. Use the code FFHOLIDAY12 at checkout - it's good from today 10/9 until Saturday 10/13. Personally, I've been wanting to try the Naked Skin Foundation ever since it came out and I think I'm finally going to bite the bullet and pick it up. If you've been wanting the original Naked or Naked 2 palette, they're eligible for the discount too so it's a great time to pick them up. If you do score a few goodies, share them below. 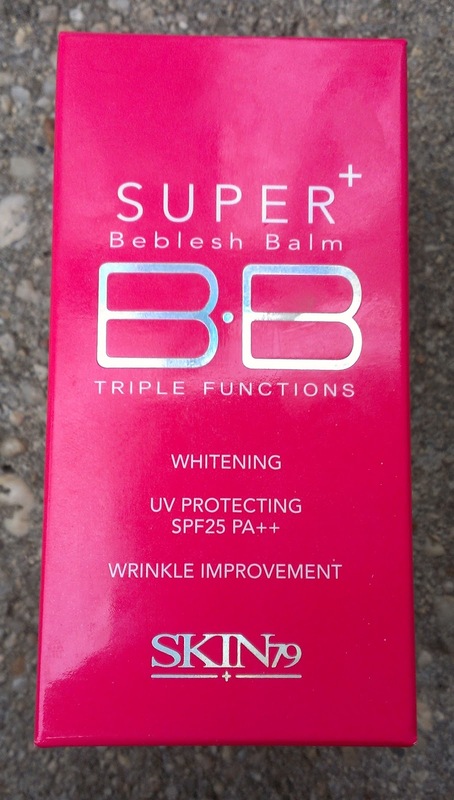 Last week when I review the Skin79 Triple Function BB Cream, I mentioned that I picked up the Missha Perfect Cover BB Cream from Amazon. The Missha BB Cream took a little longer to get here since it came directly from Korea. 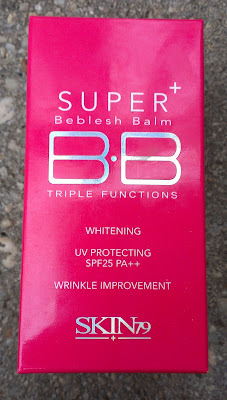 Like the Skin79 BB Cream, the Missha Perfect Cover BB Cream is very different from American versions. I've tried quite a few American BB creams this year - I own the Smashbox and Too Faced versions, and have used samples of the Maybelline, L'Oreal, Garnier and Dr. Brandt ones as well. With the exception of the Smashbox BB cream, I really haven't been that impressed. The rest pretty much seem like glorified tinted moisturizers. If you were unable to purchase anything from MAC's Marilyn Monroe Collection before it sold out and are feeling bummed about it, I think I can make you feel a little bit better. You're really not missing out on much. Now, don't get me wrong - I am thrilled with my purchases and there are a couple of products that I'm pretty much in love with. But on the whole, there's really nothing particularly special about the colors or products in this collection. In the end, it's really the packaging that makes this collection so special. This review has been a long time coming. 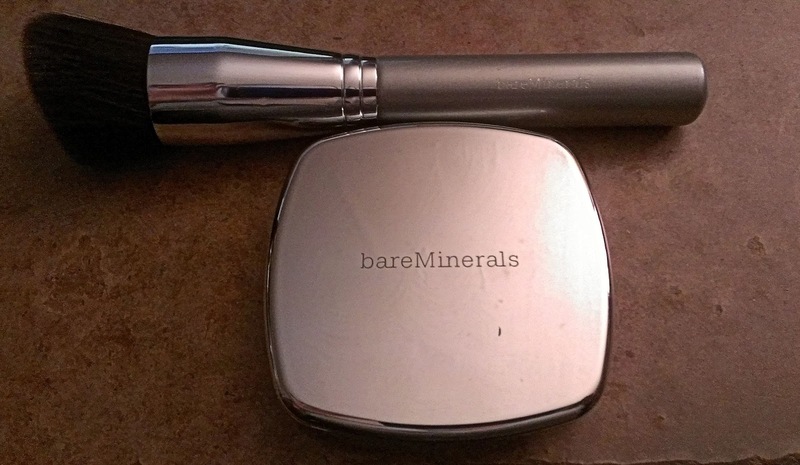 I received my bareMinerals Ready SPF20 Foundation more than a month ago, and while I like to experiment with products for a while before I share my feelings, I usually don't take a full month. Unless it's a skin care product, you can pretty much tell in a week or so whether a foundation, eye shadow, lipstick etc. works for you. But I think with the Ready Foundation, I kind of didn't want to admit how I really felt about it. I seriously can't figure out where this year has gone. But I definitely enjoyed September - the weather finally cooled off a bit here on Long Island, so it actually felt like fall. I especially love fall makeup.